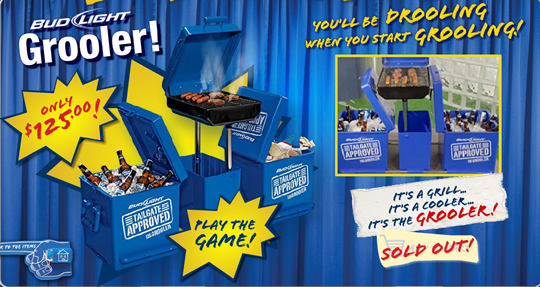 During Sunday NFL games, Bud Light has been running a series of "Tailgate Approved" parody infomercials for a bunch of seemingly-fake products including the Foozie, a combo foam hand / beer coozie, and the Tailgate Companion, a jacket for a dog with sleeves to hold beers and condiments. But you can, in fact, buy all the products online. What stood out was the Grooler, a genius invention that combines a pop-up grill and two coolers. On wheels! Priced at $125, it feature a 2' x 2' grilling area and 3.5 cubic feet of cooler space. But what woe! It's been sold out at Tailgate Approved for the last two weeks. Here's the commercial with Jimmy the spokesperson for the Grooler: "Ring Ring Ring! It's the future! Are we here? I think we are!" Won't the grill melt the cooler lids? This has been driving me nuts. Do you think that the grooler will be back in time for Christmas.